Reference number for this case: 31-Aug-54-Lyon. Thank you for including this reference number in any correspondence with me regarding this case. At 2015 hours on 31 August 1954, Henri Tardy is reported to have seen a flying object in the shape of a short, fat cigar flying from east to west over Lyon. The object was bluish-green in color and emitted sparks from its tail. It disappeared in a few seconds towards the radio beacon of Mount Verdon. By the last days of August Europe was swarming with UFOs if we can believe reports from Villacoublay, Brittany, Anger, Amiens, Lyon, and the Paris region of France; Munich and Berlin in Germany; Innsbruck in Austria; Trieste in Italy; and Stone and Stafford in England; to name a few. The visitation at Villacoublay on the 29th was seen and reported by military and technical personnel stationed at the French air base located in the vicinity. 214. 214. Michel, Aime. "Flying Saucers In Europe - Saucers or Delusions" Fate January 1, 1958. p.32. [---] Article in the newspaper Paris-Dakar, Dakkar, Senegal, September 2, 1954. 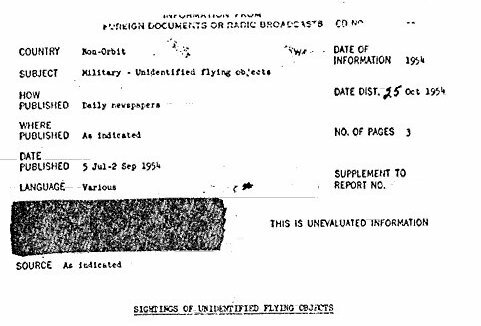 [ci1] "Information from foreign documents or Radio Broadcast - Sightings of Unidentified Flying Objects, 31 July - 20 September 1954", rapport de la CIA (Central Intelligence Agency, USA), Report, pages 1,2, October 25, 1954. [---] "Flying Saucers In Europe - Saucers or Delusions", article by Aimé Michel, in Fate magazine, USA, page 32, January 1, 1958. [lg1] "UFOs: A History - 1954 June-August", monography by Loren Gross, USA, page 96, 1990. 1.0 Patrick Gross March 4, 2010 Conversion from HTML to XHTML Strict. First formal version. 1.1 Patrick Gross November 25, 2016 Addition [lg1].